Help on Lowering and wheels upgrade!. Well Yesterday the Audi A8 D3 Quattro Sport has been packed off for her ten day full strip down and full respray and complete freshen up on how she looks. I'm not going too mad, just a quality job, and replacing the badges back on with the latest D4 badges. However whilst it's there I have the option of one of the guys fitting lowering links for me if I provide them, but then I thought hey, lets get wheels as well and having it ready to collect on the day finished and looking great! Secondly I currently have the 19" alloys on it with the 255/40/19 which I believe are 9j's and et52. What I would like is to go up to 21" and get the correct tyre size that would not only keep the speedo true and correct but also allow for the modest drop I also want to do with the suspension. Id someone could let me know exactly what Alloy width to get on a 21" alloy and the tyre sizes then I can simply get something that is available. I would if it's possible like the wheel to come out to the arches so either a good offset or if I have to use various sized spacers front and rear to get the desire effect. If any one could help me with this I would be ever so grateful. Also if anyone reckons that the VAGOM option of lowering is better, I'm more than happy to travel and pay someone not too far away from Cornwall that knows what they are doing. I have seen a few cars with the sort of ride height I'm looking for so know I'm not being unreasonable asking for what I want, it's just not being knowledgeable about cars I'm not sure what it is that I need to try and locate. Model: MY 2008 08 3.0TDI Quattro Sport, Black on Black (Transporter Edition) Lowered 60mm on drop link bars. Alloys swapped out to RS6 style 20" x 9.5". It's got full tints on all windows, and has the black leather interior. Remapped by Elite Automotive in Cornwall, giving an increase output to 290bhp/450lbs. Options: Keyless Entry & Start, Bluetooth Hands Free, Quad Zone Climate, 3 Spoke Sports Tiptronic Multi Function Steering Wheel, Black Leather Comfort Seats, AMI, Drivers & Passenger Electric Memory Seats, Auto Dimming Mirrors, Bi-Xenons. 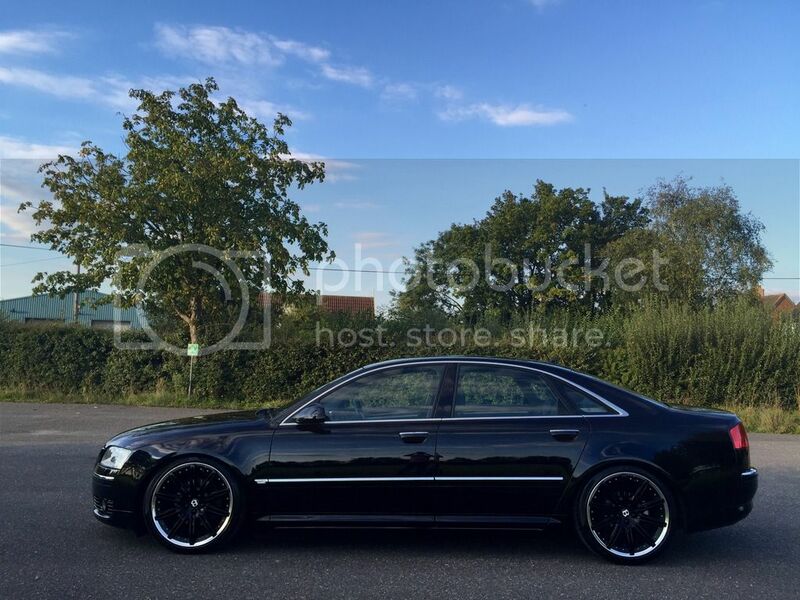 Selling my current Audi A8 Quattro Sport and replace is with a newer D4 Audi A8L with the 4.2V8 Twin Turbo setup once again it must be black. I'm looking for one with the options added where it has the rear recliing seats, with heated outers. Bose speakers minimum and B&O's if affordable. Rear and back door sun blinds prefered. Upon the arrival of my A8L D4, I will be once again having the ECU remapped to a performance setting over economy. Rear Tints as dark as can go whilst also tinting the front windows with a medium tint. Once again I will be purchasing lowering links for the air ride suspension and setting it at 55mm lower when in comfort as my desire rideheight over standard. Alloys will be 21" however the one current most likly to be the next car already has a brand new set of 2016 S8Plus wheels on it. 255/30 21 would work on the same width, but they ain't cheap at more than £250 a corner for something decent. Why 21s, most go for 20s on the D3 as larger especially with lowering links will give you a crash harsh ride with unpredictable handling. The QS is already lowered 25mm compared to standard, and the lower you go the harder the suspension gets regardless of MMI setting. If you go to low then you run the risk of bottoming out the suspension especially in dynamic mode. Thanks for your reply Mannyo, I was playing about on the "wiiltheyfit.com" website and managed to get the same rolling circumference on some of the inputted tyre sizes I entered, I think the 255/30/21's was one of them so realised that the exact same rolling circumference would not hinder the car at all over the way it is now, but basically wanted to lose the height to get rid of the large gaps between wheel and arch by using one of the suspension methods. Secondly I was looking at the various offsets offered in the 5x112x 21" wheels offered on the likes of eBay and noticed that the offset of my et52 going to an et25 would push the wheel another 22mm closer towards the lip of the arch without using spacers so that it would look flush looking down the length of the car, and giving it a better overall look with the larger wheels. I wasn't aware that the Quattro Sport was a full inch lower that the non sport versions, I was just looking at the gap I could see and other images of cars I've seen lowered and wanted to get rid of the gap and following others on here who've made their D3's look awesome for the sake of a small amount of drop on their suspension. I'm also a ware of tyre prices for unfamiliar and less popular profiles, but having a mate who owns a tyre fitting chain down in Cornwall I get a hefty discount on tyres so price wouldn't be something I would really consider when buying 21's for my Audi, it's the look that I'm after most of all... Black Car, Black Tints, 4 Digit Number Plate... 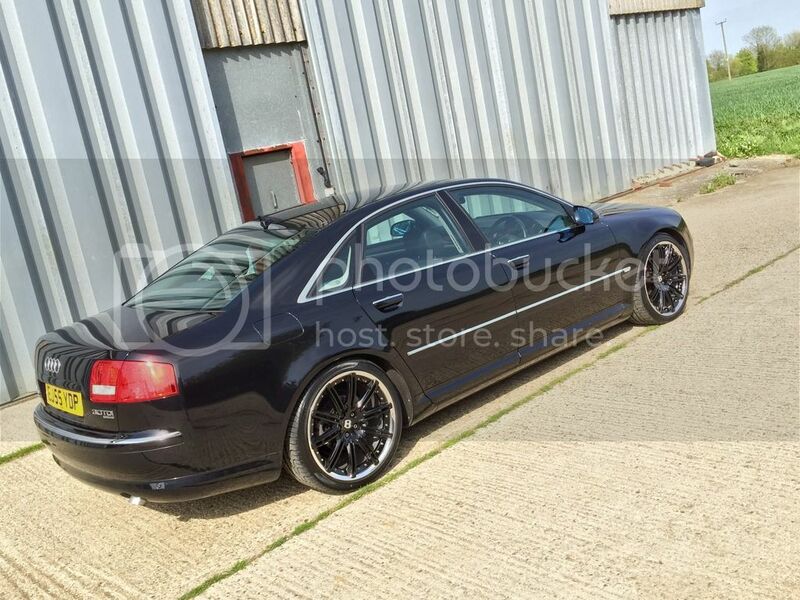 I wanted a stand out, wow sort of Car which in the Posh area I live you need to buy some serious cars to fit in and I have the D3 which is an Audi A8 so has pedigree, I just need a touch or two in the right place to make it turn the heads of the others living here who have a couple of £50k cars each. Find a suitable wheel up to about 10j and then find appropriate tyres to fit. At 10j you'll be looking closer to 295 width, and may want to consider dripping to a 25 profile to keep rolling radius the same. I would go with lowering links. After trying many times to get my car lower with VCDS I eventually gave up, the links to 20 minutes to fit and another 20 minutes to adjust to the desired height. Lowering links all the way mate. I fitted some and it was so easy to do, I've adjusted my ride height in 5 mins as I want to go lower but now I'm at a perfect height..... The links I purchased now have an even better version out that you can adjust whilst on the car. But I have these ones. 21" and lowering will cause issues I think, and there are far better looking wheels in 20"..... Oem high end vag wheels just work so well. This is it pretty low for a daily driver. But this is how it was before I dropped it some more like above pic. Well this reply is perfect! The look of your car is pretty much what I'm aiming for except I have full tints front and rear to add to the look. The link I did think was the best way to go but wasn't sure. Do these come pre adjusted for the car or is it adjust yourself once you've got them based on the ride height that you are after? Yeah I'm aware of the much cheaper 20"s out there, and the range is awesome, but I have seen quite a few 2015 Audi's on OEM 21's and they look the nuts even on the standard ride height. I think I found a wheel and tyre set up that will keep the rolling circumference the same as it is now whilst also keeping the front and rear identical. I wasn't keep on the staggered fitment idea, so thought best to get the same all round. How much lower from standard is the first image and how much on the second, I use my car as a daily driver and live in Cornwall so don't want to go mental just loose the gap in the arch, space for nothing if you ask me. I've just noticed that the newer version of the lowering links are an extra £50:00, surely once they are on the car and set up the only advantage would be the fact the newer ones have the bend in the longer ones so won't knock as assumedly the older ones did? Which ones would you go for, would you say it's worth it for the newer ones or simply stick with the originals that have most probably sold in their thousands at this point? There the same shape for both of them mate just the expensive ones are easy to adjust and you don't need to pop them off to adjust again. You simply turn the middle part and it lowers. If you're just lowering once then the cheaper ones. But I always want to go lower so if have the new ones buying again. Ha. Wheel choice made up yet?